The houses in the chart represent arenas of activity, skills or themes. How active you are, or your feelings toward each house or arena of activity depend on how the planets and signs fall in your chart. One planet or sign may make a house feel unwelcoming. Another sign or planet may make a house feel warm and cozy. The houses do not have any influence in and of themselves. Rather, they are places. Each house represents a specific area of life from ego development, to family and career. The first through fourth houses are the personal houses. The fifth through eighth are the relationship houses, and the ninth through twelfth are the universal houses. Planets in houses show what things are important to you and how you spend your time. If the planet is the Sun, Moon or the ruler of your ascendant (rising sign), this is a powerful house for you. A truer representation of a planet is found when it is alone in a house versus when it is together and often conjunct other planets in the same house. The force of the planet is felt more powerfully because it isn't competing with any other planet for influence, or being modified by any other planets in the house. Read the planet descriptions for each of these planets, then read the house description to understand the effects. This house represents your cozy, comfort zone. You do not need to grow and develop here and you don't necessarily feel more alive here. You feel at home here. You are already a master of the skills represented by this house. You retreat to the activities of this house when you need comfort. During various parts of your life, this will be the house in which you spend the majority of your time. When you need a break from the house containing your sun because you are burnt out or tired, you will retreat to the house of your moon. The house of the moon is a constant in your chart. It is a place of comfort and devoting an ample amount of time to the activities of this house gives a feeling of completeness and peace. This house plays an important role in your life. Planets contained together in the same house create a combination of their effects. Each planet is either tempered or aroused by the other planets in the same house when they are conjunct. If they are not conjunct, they will each color the house but will retain their uniqueness rather than being modified by a conjunct planet. A house containing three planets will play a big role in your life. If one of the three planets is the sun or moon, the house will have a huge influence, and most of your time, interest, and effort will be focused on this house. Through relationships we can fill our empty, weak or difficult houses by allowing another person's strength to assist us. An empty house will still have meaning based on the sign placed there and how the other planets pull on the house. Also, what is missing in a house can be completed through a relationship with another person. An empty house which contains the sign Taurus, for example, may give an attraction to people with a heavy Taurus influence in their chart. The other person's Taurus will fill the house for us. This house represents the area of your life where you will feel energized. When you are engaged in the activities of the houses containing your sun, you will shine, like the sun! You will feel invigorated and more alive. This is a house where you constantly feel that you need to grow, develop and master a skill. This is a feeling of yearning. You are constantly drawn to this house because you need to develop the skills or tasks of this house. A feeling of satisfaction and pleasure is gained by engaging in the activities of the house in which your sun is placed. ​Public versus Private: The fourth house of Cancer is the most private house and the tenth house of Capricorn is the most public. The northern houses are houses one through six, the houses on the bottom half of the chart (Northern Hemisphere). They are inner houses and represent your private world, rather than your public world. The southern houses are houses seven through twelve (Southern Hemisphere). The arrows represent a gradual change from the private, northern hemisphere to public, southern hemisphere and vice versa. There is no hard cut line on the chart. It is gradual movement. The fifth and sixth houses are relationship houses, but still private houses. They are beginning to move toward the public half of the chart in that they involve other people, but they are still private in that they involve the private aspects of relationships. 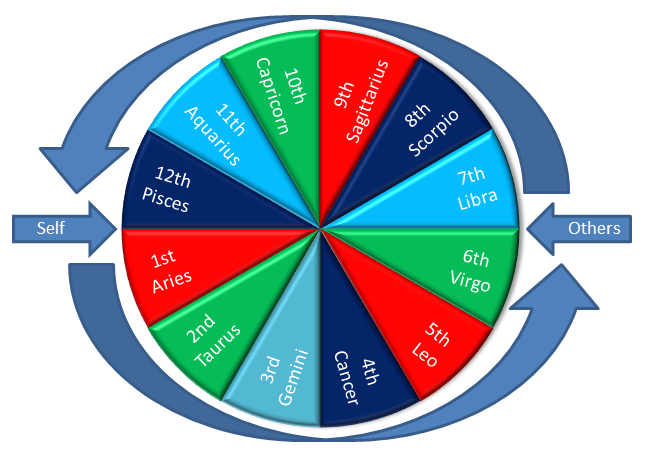 The tenth house of Capricorn is where we are most public and the fourth house is where we are most private. The tenth house is about career and your status and success in the outside, public world. The fourth house is about your home and family, your private life. Self versus Others: The first house of Aries is the most self oriented house and the seventh house of Libra is the most other oriented. Starting with the first house of Aries and moving around to the twelfth house of Pisces, a change in focus from self to others starts with Aries and ends with Pisces. The entire left side of the chart (Eastern Hemisphere) is more self oriented with the epitome being the first house. The entire right side (Western Hemisphere) is other oriented with the epitome being the seventh house. Again, this is a gradual movement around the chart. 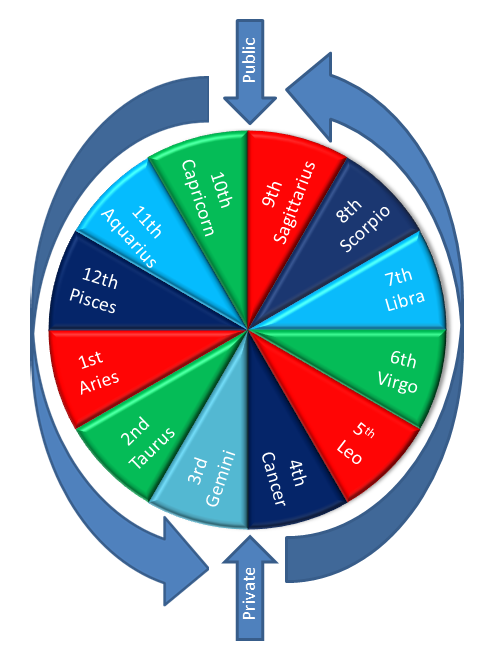 The eleventh house of Aquarius and the twelfth house of Pisces are universal houses but are on the self side of the chart. In the eleventh house, we want to share ourselves, our talents and gifts with the world. The twelfth house, is about examining how you, "yourself" relate to the world.